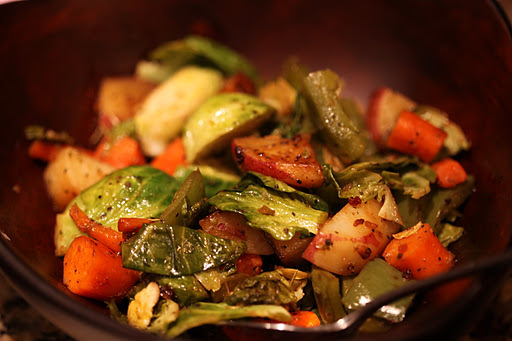 Brussel sprouts, potatoes, carrots, and peppers. While I’m not vegetarian, I do tend to cook a lot of vegetarian meals. To many people, these would be considered sides. To me, why not make a meal out of it? My siblings and I were all pescatarians for years — we ate seafood but no other meat products. What I remember fondly about Thanksgiving/Easter/Christmas meals those years was all the sides we put together as our meals. When you skip out on the turkey, you have a heaping plate full of all the veggie goodness. The problem I have with vegetarian meals is that I’m often hungry later if I don’t have a good source of protein or carbs in the dish. So tonight I decided to cook brussel sprouts with potatoes, carrots, and peppers. 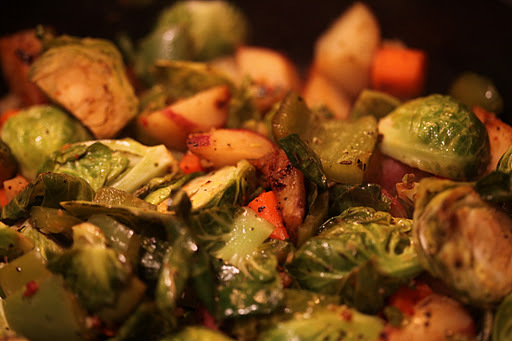 Now, many people hate and despise brussel sprouts. Or, at least they think they do based on never having eaten well-prepared brussel sprouts. I have always liked them okay, but I do think they are best when enjoyed with other accompaniments. I wanted to cook them up with some red russet potatoes so I can have a bit of a carb fix and feel satiated from my otherwise super healthy meal. 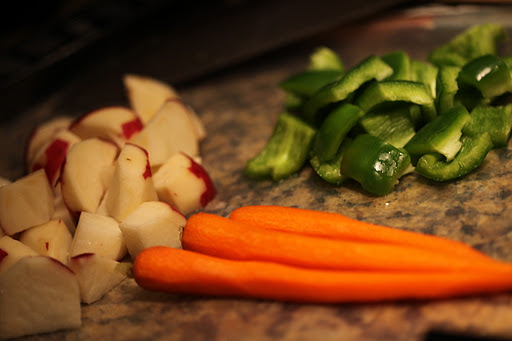 The carrots and green peppers just added a little sweetness to the dish and helped provide some color and texture. First step was to peel and cube the potatoes. I like to leave some skin on. The potatoes were added to the saute pan which was prepped with some olive oil, minced garlic, and some vegetable seasoning mix, Cavenders, and rosemary. 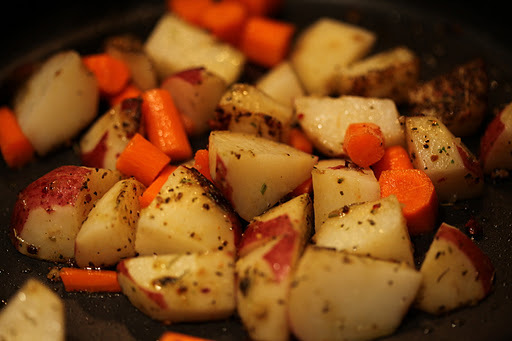 I kept the pan covered as the potatoes cooked, waited about 5-7 minutes before adding the chopped carrots. 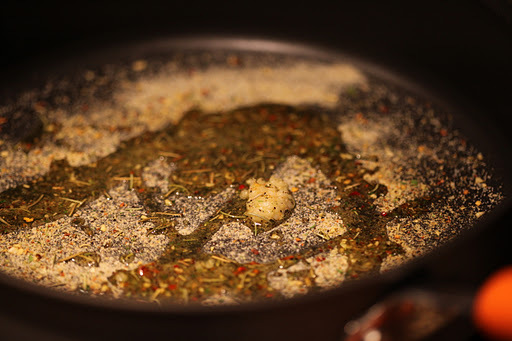 Several more minutes passed before I added the green peppers, continually stirring the pan each time I lifted the cover to check on tenderness. 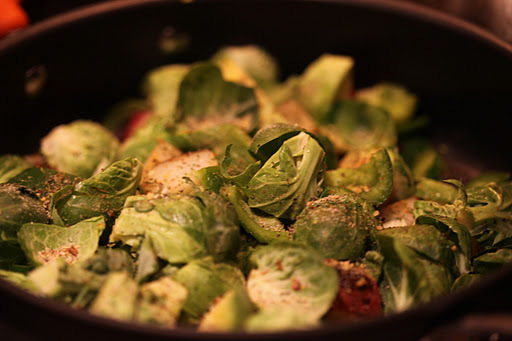 Once I added the brussel sprouts, I added just about a tablespoon of water to help steam them further. Since all my seasoning was now covering the potatoes and carrots, I also added just a bit more seasoning on top of the brussel sprouts. Deciding to add a little more flavor, I added about a tablespoon of balsamic vinegar and a tablespoon of teriyaki sauce. I stirred the veggies around a bit longer and kept it covered for several more minutes. Total cooking time was approximately 25 minutes. The potatoes were perfectly cooked, the carrots and peppers were tender, and the brussel sprouts were still crunchy but the bitterness had been cooked off. What a lovely meal. This could be a great side dish, sure. But I loved every bite of it as my dinner and feel wholly satisfied afterwards. The only thing that would have made it more perfect would have been a nice glass of wine, but I’m trying to be good. I’m looking forward to the leftovers tomorrow.